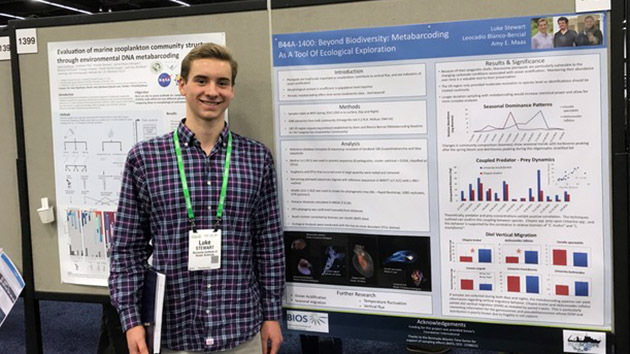 Luke Stewart, high school senior and former research intern at BIOS, stands in front of his research poster at the 2018 Ocean Sciences Meeting in Portland, Oregon. It’s not every day that you meet a high school student who already has three summers of scientific research, as well as a poster presentation at a professional scientific conference, under his belt. But Luke Stewart isn’t your average student. Stewart, currently in his senior year at New Canaan High School in Connecticut, first came to BIOS in 2015 after his freshman year for the Marine Science Internship (MSI) program. The two-week, immersive internship gives students the opportunity to build SCUBA skills while working on independent research projects and laboratory investigations. The MSI experience inspired Stewart so much that he arranged for an additional two weeks at BIOS to work in a research internship with Amy Maas, a comparative physiologist and biological oceanographer at BIOS. Maas studies how the environment influences the distribution and biology of marine invertebrates, such as zooplankton. Maas worked with Stewart to develop a short-term research project investigating the impact of ocean acidification on marine organisms, such as foraminifera and mussels, that construct protective shells from calcium and are among the first to be impacted by changes in the ocean's pH, a measure of acidity. During this two-week period, Stewart’s family traveled to Bermuda for a short beach holiday; however, he enjoyed working in the lab so much that he ended up spending all his time there. "I never even saw the South Shore beaches of Bermuda until my third year," laughed Stewart. When it came time to make plans for the following summer in 2016, Stewart knew exactly where he wanted to be: back at BIOS working with Maas to complete the research he’d begun the previous summer. 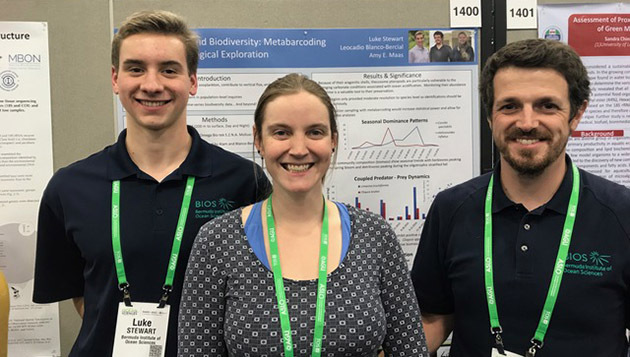 Stewart (on left) met with his BIOS mentors Amy Maas, a comparative physiologist and biological oceanographer, and Leocadio Blanco-Bercial, a zooplankton ecologist, last month at the Ocean Sciences Meeting poster session. Last summer, his third at BIOS, Stewart returned to jointly plan a research project he worked on with Maas and Leocadio Blanco-Bercial, a zooplankton ecologist at BIOS who investigates the zooplankton community at the Bermuda Atlantic Time-series Study (BATS) site. This new project allowed Stewart to transition away from analyzing the morphology—or form and structure—of individual zooplankton, to researching genetics and DNA taxonomy within a larger zooplankton community. Specifically, his project tested the accuracy of a new metabarcoding procedure, developed by Blanco-Bercial. This procedure rapidly identifies multiple organisms within a community (or sample) using DNA identification and genetic sequencing. Both terrestrial and marine scientists use metabarcoding as a more affordable and efficient way to monitor community biodiversity, particularly in areas with a high number of species, such as tropical rainforests or the ocean. This past summer, Stewart learned how to extract DNA and worked with a bioinformatics pipeline—computer algorithms used to process large amounts of metabarcoding data—to pull a subset of information out of an ongoing project that consists of hundreds of gigabytes of data, Maas said. “This is an impressive feat for someone who has never taken a class in programming,” she said. With his mentors’ support and guidance, Stewart used this work as the basis for submitting a research poster, titled “Beyond Biodiversity: Metabarcoding as a Tool of Ecological Exploration,” for presentation at the 2018 Ocean Sciences Meeting held last month in Portland, Oregon. This bi-annual, interdisciplinary conference brings together scientists, engineers, students, educators, and other stakeholders from all areas of ocean science, from fisheries and ocean observatories to coastal dynamics and ocean policy. With over 4,000 attendees, the Ocean Sciences Meeting resonates with early-career scientists like Stewart. Beyond the tangible scientific data and conference attendance, Stewart recognizes that he’s gained so much more from his time at BIOS: the value of a collaborative group of peers; the skills to tackle increasingly complicated research plans and data analyses; and the creativity and patience required to meet unexpected challenges in both the field and laboratory. Many of these lessons he attributes to dedicated mentors, but he also gives a nod to the time he spent every day having lunch with other students and scientists at BIOS and discussing their various research projects. Like many other high school seniors, Stewart is in the process of deciding which college to attend, as he has received offers from multiple institutions. Regardless of where he ends up, he hopes to pursue a degree in biology and it should come as no surprise that he also has his eye on returning to BIOS at some point to continue his research.